High ceilings may be a desired feature in modern homes, but they come with a price, which shows up on your heating bill. Because heat rises, homeowners often run into issues of maintaining consistent heat throughout a high-ceiling room. But simply cranking the heat up isn’t an effective solution if that “extra” heat just keeps rising. Don’t despair. Here are some tips on how to maintain even temperatures without overworking your furnace. Conventional advice is to run the fan(s) in reverse in the winter to help push the warmer air that’s risen back down into the room. And in many rooms that is the most comfortable way to do it. But, that technique depends on the height of the room, the distance that the fan is from the ceiling, and the room size. Often, it's most efficient to run it in reverse for 2-3 days, then switch it back to run regularly for a few days. 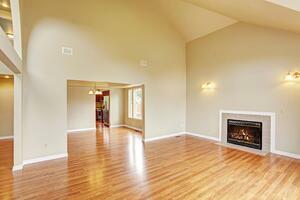 You may find that the floors are warmer when the fan is running at its standard setting. If ceiling fans alone aren’t solving your heating issue, consider adding ceiling fan heaters. These are small heaters that are installed just under the fan itself. They provide more warm air for the fans, running in reverse, to direct downward. Adding electric heaters to a room is a time-tested solution and may work well for a smaller room. But, keep in mind that electric space heaters can rack up the costs if you’re using them to heat a larger space. If you’re still experiencing a high-ceiling living area that your forced-air system just isn’t keeping as comfortably warm as you’d like, consider installing radiant floor heating. Radiant heating works differently than forced air heating. It heats objects, rather than the air. A radiant floor system will deliver heat evenly throughout your room, first heating the floor, then surrounding objects — like your furniture and you. That means your favorite chair will be warm when you sit down, creating the ultimate in comfort. And because of their efficiency, radiant floor heating systems may even cut down on your energy bills. As with most heating systems, there are options to choose from in terms of the how radiant systems are constructed, the materials used, their energy source, and the reliability of manufacturers and installers. Costs can also vary significantly depending on the type of system you get and how well your home lends itself to installing it. If you’re considering a radiant system, you’ll want to consult with an HVAC professional to determine what will work best in your home. A professional will be able to assess if you just need coverage in one or two rooms, or if you might be a candidate for a whole-house system. And they’ll be able to recommend the most efficient type of system for your home. That's it. You're one step closer to a warmer, more comfortable winter indoors. To find a reliable HVAC pro, use our convenient dealer locator. Does Your Furnace Work Harder When It's Colder?